Austrian pianist; born at Vienna Jan. 6, 1806; died at Paris Jan. 5, 1888. He commenced his studies at Coblenz under the guidance of his father, and later studied there with Hünten. In 1816 he entered the Conservatoire at Paris, where, after a course of several years with Reicha, Pradher, and Dourlen, he was graduated, receiving the first prize for pianoforte-playing. The concerts given by Moscheles at Paris in 1820 exercised great influence upon Herz's style, which now became most brilliant. In 1831 Herz accompanied the violinist Lafont to Germany, and in 1838-39 they made another tour, through Holland and France, but this was suddenly terminated by the tragic death of Lafont, who was thrown out of his carriage and instantly killed. In 1838 Herz gave a series of concerts in England, Ireland, and Scotland, playing twelve times in Dublin alone. Four years later he was appointed professor of piano at the Conservatoire at Paris, and soon was held in high repute as a teacher. Being unsuccessful in a business venture which he had undertaken at this time, Herz in 1845 made a concert tour through the United States, Mexico, the West Indies, Peru, and Chile, returning to Paris in 1851. It was during this journey that, at the request of General Herrera, President of Mexico, he composed the hymn which has since remained the national anthem of that country. Upon his return to France Herz established a piano manufactory, his instruments receiving the first prize at the Paris Exposition of 1855. He resigned his position at the Conservatoire in 1874. Although immensely popular thirty or forty years ago, very few of the compositions of Herz (comprising in all about 200 pieces) are played to-day. They include pianoforte concertos, nocturnes, dances, marches, and fantasies. His "Air Tyrolien Varié" (1818) and "Methode Complète de Piano" deserve special mention. 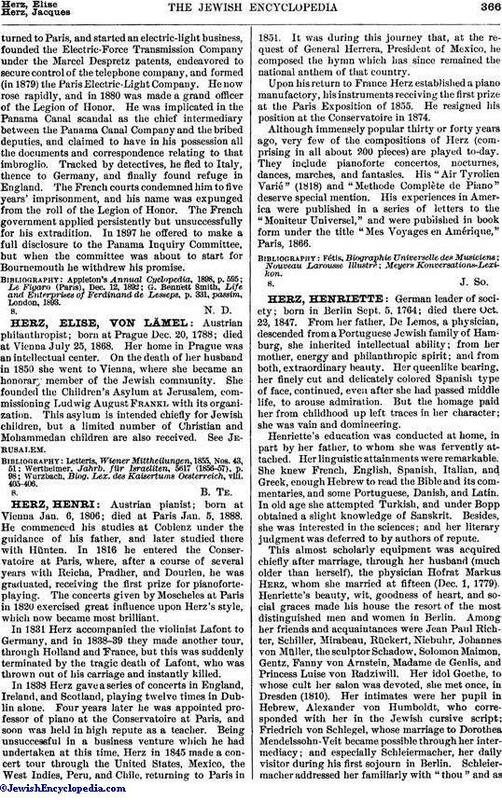 His experiences in America were published in a series of letters to the "Moniteur Universel," and were published in book form under the title "Mes Voyages en Amérique," Paris, 1866.